Are you a quilter? Take the quiz. I remember when I was around college age and realized I was no longer a girl, I was a woman. Then later on, I came to call myself middle aged and I plan to fiercely hold onto that designation forever. Other ways of describing myself over the years have been adopting the title of wife, mom and grandma. In life, we can embrace different descriptions of who we are and what we do. Sewer or sewist? Making quilts or a quilter? Quilter or fabric artist? It took me a while to self identify as quilter and now I don't even think about it. For those of you who are wondering if you are a "quilter" I have some help. Read these attributes of quilters and give yourself one point if it applies to you. By then end you will have the answer to the question, are you a quilter? Ready? Go! 1. Threads are not only on your clothes but somehow migrate to other family members. Or the dog. 2. You have survived a quilting injury. Bonus point if there was blood. Triple points if it involved an ER. 3. 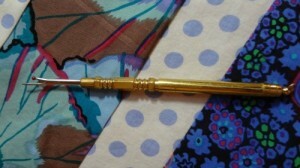 You are on intimate terms with your seam ripper. Bonus point if you have given it a name. 4. When left alone with a another quilter's quilt you've examined it to see how she made it. 6. Your fabrics might best be viewed as a collection rather than an actual usable amount. 7. You can tell if something is a modern quilt just by glancing at it. 8. If I say fat - how do you respond? If it was quarter, give yourself a point. 9. Quarter inch seams are your friend. 10. You feel physically better if you've spent time sewing or quilting. 11. You've purchased fabric in more than three states. 12. You've purchased fabric in more than one country. 13. You own more than one sewing machine. Or wish you did. 14. You've stitched in the ditch and it didn't involve a car. 15. You have more than 2 quilts in your bedroom. 16. Your walls have quilts on them. 17. You have quilts in closets you just don't know what to do with even though you no longer like them. 18. You can name your favorite brand of sewing machine, Longarm, fabric designer and thread manufacturer. 19. You have memories of quilting while watching an important event on TV. Double points if you reference past events by when you finished a quilt. 20. You know that a crazy quilt is not a psychological term. Double points if you own one. Triple if you've made one. Add up your points and see where you land. 20 points and above - You knew it, you're a quilter, you didn't even have to tally the numbers. 19 to 15 - You're a beginning quilter, you'll be there soon. Go roll around in some threads and take the quiz again. 14 and below - There's hope for you yet, come spend some time with me. Being a quilter makes me Sew happy! Quilts are being discussed, pictures are being posted and sewing adventures abound on my Facebook page. Like the page and join the conversation! If you want to keep reading my blog, you can subscribe. To do so, type your email address in the box and click the "create subscription" button. That's all, you're done. My list is completely spam free, and you can opt out at any time. If you liked this post, you might enjoy this one.